STUART, Florida, August 21, 2013 (ENS) – Environmental groups rallied today ahead of a Florida State Senate Select Committee public meeting, demanding that government act to stop toxic algae slimes that are sickening people and killing dolphins, manatees, birds and fish in two areas of the state. On Florida’s southeast coast, the St. Lucie River, its estuary, and the Indian River Lagoon are slimed with algae that grow on excess sewage, manure, and fertilizer runoff released locally and from Lake Okeechobee to the north. Most of the nutrient pollution entering Lake Okeechobee comes from tributaries in the northern Everglades that take runoff from the Everglades Agricultural Area, which grows most of the sugarcane in the United States. The St. Lucie River also is experiencing unprecedented levels of bacteria; Martin County health officials have warned the public to avoid contact with the water. Also affected by the slimy mess are the Caloosahatchee River and its Gulf of Mexico estuary on Florida’s southwest coast. Members of the Sierra Club, Florida Wildlife Federation, Earthjustice, Florida Oceanographic Society and the Conservancy of Southwest Florida said at the rally that state and federal officials have known about these nutrient pollution issues for 30 years, and have yet to take meaningful action to stop the problem at its source. 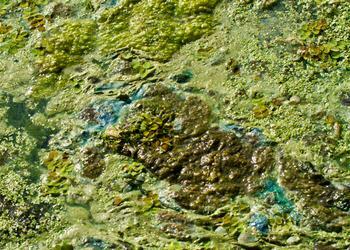 The fluorescent green and black slime of toxic algae is the environment’s response to nutrient runoff made worse by this season’s heavy rainfall. The South Florida Water Management District says July’s soaking of South Florida that capped the wettest start to the wet season since 1968 has made the situation worse. District meteorologists reported the wettest April-July period on record in South Florida since 1932. State Senator Joe Negron, a Republican who chairs the Select Committee on Indian River Lagoon and Lake Okeechobee Basin, is holding a committee hearing in Stuart on Thursday to come up with “short-term” solutions to the toxic algae outbreaks. On August 7, Negron announced the creation of a website for collecting public comments on the economic and environmental impacts of ongoing releases of nutrient-contaminated from Lake Okeechobee into the Indian River Lagoon as well as accepting suggestions for short-term solutions or alternatives. “Constituents have the option of leaving a comment related to a specific subtopic, such as pollution or property values, or a general comment about how Florida should address the economic and environmental impacts caused by the ongoing releases from Lake Okeechobee,” said Negron. The environmental groups have plenty of advice for the Select Committee. “Septic tanks need to be cleaned out and connected to treatment plants, failing sewer lines that pour sewage into the estuary need to be replaced, sewage treatment plants must be upgraded, fertilizer ordinances must be adopted statewide, and, most importantly, agricultural pollution – the primary source of the filthy water into Lake Okeechobee – needs to be regulated,” they said in a statement today. “Both the state and federal governments have slime on their hands,” said Earthjustice attorney Monica Reimer. “The U.S. Army Corps of Engineers is responsible because it is not fixing a failing 80-year-old reservoir system that’s operated at the behest of Big Sugar, instead of for the citizens of this state,” said Reimer. In July, environmental groups filed a lawsuit alleging the U.S. Army Corps of Engineers has damaged the Caloosahatchee River by failing to release enough fresh, clean water from Lake Okeechobee. The plaintiff groups, Earthjustice, the Conservancy of Southwest Florida and Florida Wildlife Federation, hope a federal judge will order the Corps to maintain freshwater flow levels that, they say, are already mandated by state law. Water testing by the Florida Department of Environmental Protection shows that algae toxin levels in the St. Lucie River estuary have reached levels 287 times the safe limit for human recreational activities. They also reveal algae is present which produce neurotoxins that affect the brain, but no further testing for those neurotoxins was done. Published scientific research has confirmed the widespread presence of a type of cyanotoxin linked to Parkinson’s and Alzheimer’s-like symptoms in Florida coastal waters, yet no testing for that cyanotoxin was performed by the DEP. 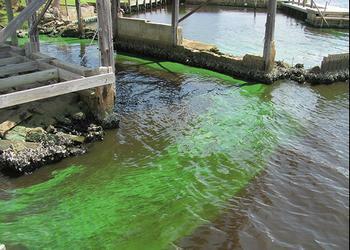 Instead of preventing the pollution problem at its source, the Scott Administration “has been allowing polluter lobbyists to write their own loophole-ridden mumbo-jumbo that does little to regulate the sewage, manure and fertilizer pollution that sparks these nasty toxic algae outbreaks,” the environmentalists warn. The Florida Senate Select Committee on Indian River Lagoon and Lake Okeechobee Basin will meet on Thursday, August 22, 2013, from 1:00 pm to 9:00 pm at the Charles and Rae Kane Center in Stuart. They will receive expert and public testimony on activities affecting water management in the Indian River Lagoon and Lake Okeechobee Basin. The Select Committee has invited U.S. Senator Patrick Murphy, a Florida Democrat, to speak at the public meeting. Murphy represents Florida’s 18th Congressional District, which includes Stuart and the St. Lucie area. The governor has not indicated whether or not he will accept Murphy’s invitation. Today, Scott toured the St. Lucie Lock to view the algal mess for himself, but he ignored some 300 demonstrators who chanted “Save our river,” looking at the water and then leaving without acknowledging them. On Tuesday, Scott announced a $40 million budget proposal to speed up completion of the C-44 Storm Water Treatment Area project. The project will clean diverted water from Lake Okeechobee and stormwater runoff year-round. 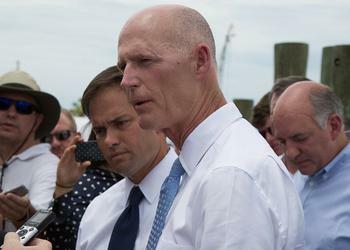 The governor blamed the federal government for failing to meet its obligations in maintaining the federally operated Lake Okeechobee dike system and fulfilling its cost-share obligations to the State of Florida for environmental projects. Scott said, “We’re here because the Corps is not maintaining the Lake Okeechobee dike system and they’re not fulfilling their financial commitment to Florida. Florida families are paying the price for federal inaction. Despite federal inaction, we are speeding up solutions because Florida’s families and the environment can’t wait any longer. But the environmental groups today called the governor’s $40 million announcement a “Band-aid” that only treats the symptoms, not the causes, of the toxic outbreaks.